Tired of his unhealthy ways, this Air Force radio tech changed his frequency. Fredrick McMillan played organized football from peewee through his sophomore year of high school, but he was only 16 years old when his girlfriend became pregnant with his oldest daughter. The new baby's arrival took sports, and the rest of his high school years, out of the picture. A young, unprepared father hoping for assistance with his life, McMillan decided to join the Youth Challenge Academy, a program for troubled teens, run by the military. Later, he began a professional career with the U.S. Air Force. Every year, McMillan had to pass a physical fitness test, but even those who looked out of shape could meet the minimum standards, it seemed. Over his 12 years of service, he saw this time and again. He even saw his own body and general physicality decline throughout his years of service. Eventually, McMillan decided that he didn't want to limit himself to the minimum standard in anything. An acceptable level of fitness was not enough. "One of the Air Force's core values is 'Excellence in all we do,'" he says. "So, the goal is not to meet the standards. It is to exceed the standards." And that's just what he decided to do. What made you decide to transform? I had always been in relatively good condition, even when I carried a heavier body weight and more fat. But the older I became, the harder it was to get in shape if I didn't watch what I ate. At work, people brought in donuts and cakes, which I binged on. I'd often have hamburgers and fries for lunch, and I saw myself get bigger every year. So, in 2013, I briefly used Jim Stoppani's Six-Week Shortcut to Shred to lose a bunch of weight. But then, I let myself go again, until I weighed 219 pounds. I became so busy with work, college, and my kids that it was hard to find time to work out at all. Being so busy naturally meant I started to eat a lot of bad food again out of convenience. My joints hurt when I ran, and I didn't like the way I looked in my clothes. That's when I told myself that I couldn't do this anymore. I knew I needed a total lifestyle change and not just a quick fix. So, I set out to do that. I started running and doing unguided exercises, and I got down to 215 pounds in no time. Once I got there, I decided to look for a new workout plan and some supplements. I went to Bodybuilding.com and saw Modern Physique: Steve Cook's 8-Week Training Plan. So, I gave his workout plan a shot, and just followed along. What is your motivation to stay in shape? I never thought of quitting, but there are times when it became frustrating. People who see me in uniform or in full clothing can't tell that I'm ripped, so they make fun of me for eating clean and going to the gym all the time. My motivation has become just as much about health as about looking good. I think that's what keeps me from quitting like before. I used to care only about looking good, not what I put into my body. Now, I actually want to be healthy. That means there's no end date to this, and I've been really active. Most military branches have fun 5K runs, and I got into those, as well as Spartan Races through a military friend, Sgt. Jamie Dominguez. What supplements helped you through the journey? What diet plan guided your transformation? I do intermittent fasting and carb cycling at the same time. Ninety percent of what goes into my body is clean. I'll mostly eat things like turkey or chicken, sweet potatoes and spinach salad, fruit and eggs, or oatmeal with a little cinnamon. I work out in a fasted state, and as soon as I get done I have my first meal, and take my multivitamin, fish oil, and post-workout drink. I never have a cheat day, but I do have random cheat meals. I go 14 hours fasting and 10 hours non-fasting, or 16 hours fasting and 8 hours non-fasting. It varies because of how much I train and what time I finish my first workout, but I definitely go a minimum of 14 hours without eating. I've been doing it for six months now and it has worked for me. What training regimen do you adhere to now? What aspect challenges you the most? Trying to balance my love for running with the lifting I do. Some days, I'm so sore from lifting that my run times don't look as good as they should. So, if there's a 5K coming up, I go light on legs the day before, or I'll even skip legs the day before. I give out all my experience, diet, and training techniques for free. I love helping others and trying to motivate them. I have signed up for the Spartan Run Trifecta, which consists of three races (Sprint, Super, and Beast) at three different locations. After I complete that in 2018, I will figure out a new goal. Only a total lifestyle change will lead to success, but of course you'll have short-term goals along the way. If you make only short-term goals without sticking to major changes in your diet and training, you are more likely to quit and never see any significant transformation. 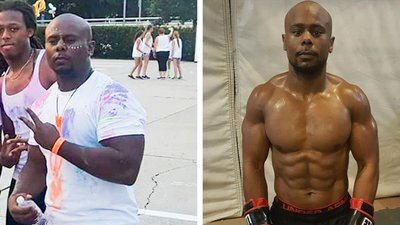 Looking at other transformations on the site made me realize that if others could do it, so could I. The workout plans are how I learned how to completely train my body. And, I get all of my supplements from the site, for a good price.